Venezuelan President Nicolas Maduro has ordered the implementation of a national electricity rationing plan as rolling blackouts enter their sixth day in the South American country. “I’ve approved a 30-day plan for [electrical] charge administration [and] equilibrium in the process of generation, secure transmission of service, and usage throughout the country,” Maduro declared in a televised address to the nation on Sunday. The president did not, however, offer details regarding the specifics of the plan, adding only that safeguarding water pumping systems is a priority. Water pumping systems in Caracas and throughout the country represent a significant demand on the electric grid, and had yet to be fully restored before Friday night’s blackout. National Commerce Minister William Contreras revealed on Sunday that an electrical generator was being installed at the Tuy pumping system, which supplies water to Caracas and nearby states. Earlier on Sunday, Communications Minister Jorge Rodriguez announced that classes will remain suspended on Monday, while the work day will be shortened to conclude at 2 pm. Services such as the Caracas metro have not been brought back online yet. The announcements come after successive blackouts on Friday and Saturday evening, which Venezuelan authorities have attributed to attacks against transmission lines coming out of the Guri Hydroelectric Dam in Bolivar State, the country’s main electricity generator. At the time of writing, electricity has been restored to at least parts of most Venezuelan states, although the service remains very unstable. Locations in western states such as Tachira and Barinas reported that electricity was restored in the early morning but only for a few hours. Electricity and water shortages saw several isolated protests break out on Sunday in Caracas and other locations, with local authorities scrambling to send tanker trucks to communities that have not had water for extended periods. 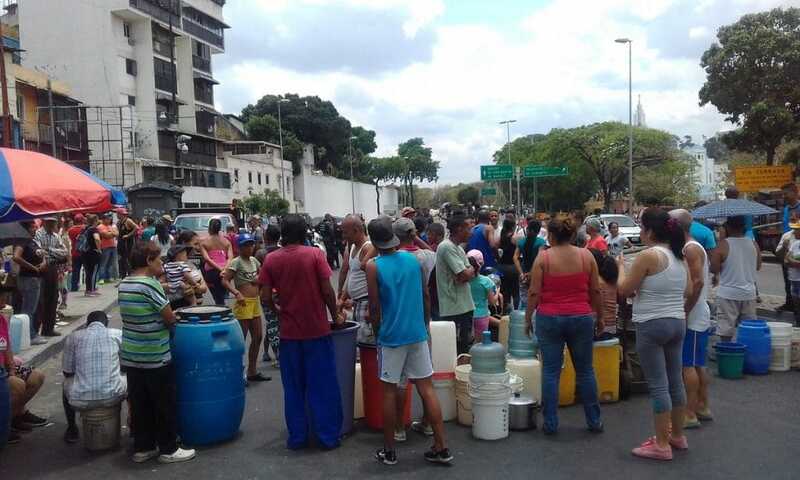 Several Caracas neighborhoods, including Catia (west), El Valle (southeast), San Juan (southwest) and Cotiza (north) saw protests over the lack of electricity and water, with residents in some cases blocking streets with barricades or burning tires. While in some situations security forces observed the protests from a distance, in others they employed armoured crowd control vehicles and tear gas to disperse them. The arrival of tanker trucks from the municipality also helped lower tensions in some cases. There were also violent clashes in Caracas’ Fuerzas Armadas Avenue on Sunday afternoon. After masked anti-government protesters barricaded the street and allegedly attacked residents who were getting water from a truck, a pro-government motorbike collective moved in to disperse the protesters. There are unconfirmed reports of two people wounded as a result. Violent disturbances also broke out on San Martin Avenue in southwest Caracas early Monday morning, with several vehicles torched. Protests were likewise seen in other states, such as Carabobo, Lara, Anzoategui and Zulia, with reports of barricaded streets and highways and authorities responding with tear gas. Over the past week, the Venezuelan government has denounced four separate attacks against the national electric grid. On March 25, authorities claimed the system suffered a cyber attack followed by an explosion of a transformer at the Guri Dam allegedly caused by sniper fire. According to Maduro, Friday and Saturday’s outages, which both occurred at around 7 pm, were the result of electromagnetic attacks against the transmission lines, though evidence has yet to be presented to substantiate the claims. This was the second major outage in less than a month. 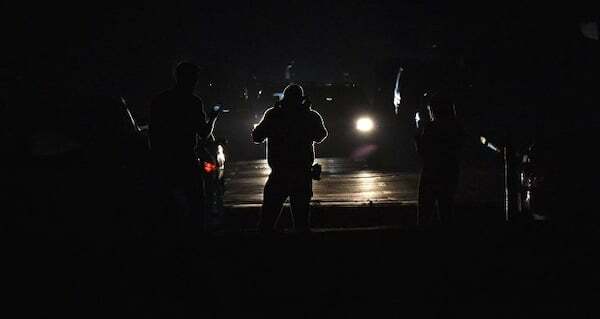 Following what authorities described as a cyber attack against the electric grid on March 7, several areas of the country had to wait up to five days before seeing electricity restored. Venezuela’s electrical grid has suffered years of under-investment and lack of maintenance as well as emigration of qualified technical personnel, which critics cite as the cause of the blackouts. According to Venezuelan Electrical Engineering and Mechanics Association President Winston Cabas, some 25,000 electrical workers have left the country since 2015, thought the figure has not been independently verified. Other experts such as Torino Capital Chief Economist Francisco Rodriguez point to the role of previous and recent U.S. sanctions in exacerbating vulnerabilities in the electrical grid, including by shuttering international credit lines and cutting off vital imports of diesel fuel needed to power thermoelectric plants. Self-proclaimed “Interim President” Juan Guaido called for protests against the electricity and water shortages over the weekend, one week before a scheduled “dry run” of what he termed “Operation Freedom.” While details of the action remain unknown, opposition leaders have presented it as the final push to oust the Maduro government. Saturday also saw a sizeable anti-imperialist Chavista demonstration in western Caracas, starting from four different locations before converging in O’Leary Plaza. The aim of the march was to preserve peace as well as express solidarity with CORPOELEC electricity workers.